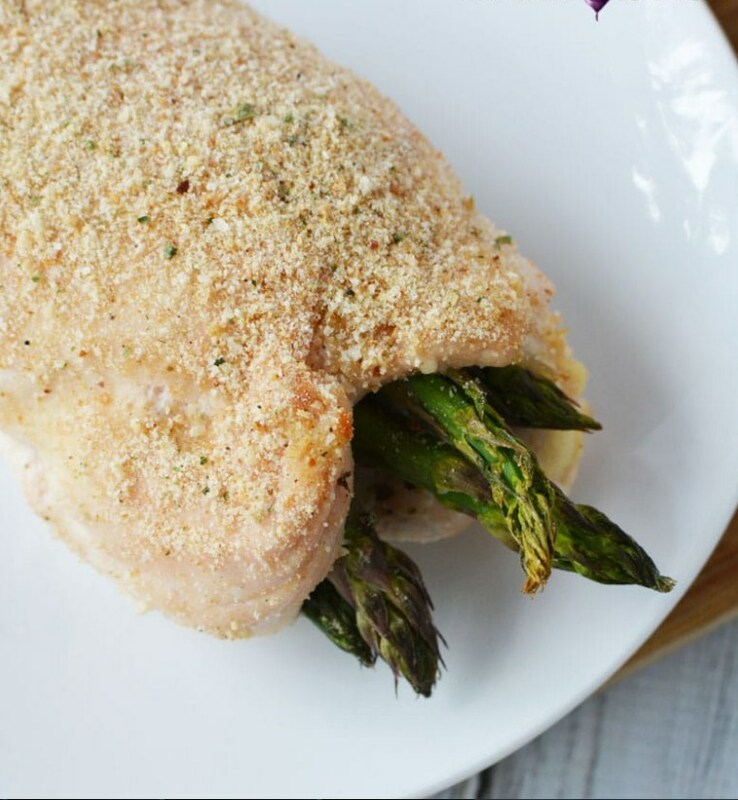 Asparagus Stuffed Chicken a fast and easy chicken breast recipe that will knock your socks off. Roll out your chicken and stuff with melty cheese and perfect asparagus spears to create an under 30 minute recipe that you can enjoy any night of the week. Preheat oven to 375 and grease a baking dish with nonstick cooking spray. Place plastic wrap on a flat surface and place a single chicken breast onto the plastic wrap. Top with another piece of plastic wrap and use a meat tenderizer to flatten chicken until about 1/2" thick. Season with salt and pepper. Add 5 slices of asparagus to the center of the chicken, sprinkle half of the cheese and half of the seasoning on top. Roll up and place seam side down on the prepared baking dish and sprinkle with half of the bread crumbs. Repeat with the second chicken breast. Bake for 25 minutes or until chicken is cooked thoroughly.